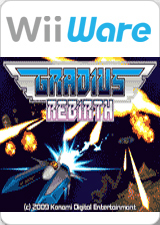 Gradius ReBirth is a shoot 'em up video game for WiiWare developed by M2 and produced and released by Konami. It is the latest installment in the Gradius series. The graph below charts the compatibility with Gradius ReBirth since Dolphin's 2.0 release, listing revisions only where a compatibility change occurred. This page was last edited on 16 January 2018, at 07:56.